M. Hakan Yavuz is a professor of political science at the University of Utah. His current academic work focuses on transnational Islamic networks in Central Asia and Turkey; the role of Islam in state-building and nationalism; ethnic cleansing and genocide; and ethno-religious conflict management. Prof. Yavuz received his undergraduate training in Turkey, earning his B.A. from Siyasal Bilgiler Fakultesi in Ankara. He received his M.A. from the University of Wisconsin-Milwaukee and studied at the Hebrew University in Israel, and obtained his Ph.D. in Political Science from University of Wisconsin-Madison. Prof. Yavuz has received fellowships from the MacArthur and Rockefeller Foundations, from the University of California, and most recently from the Tanner Humanities Center at the University of Utah. 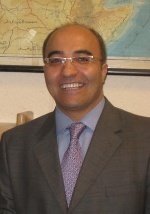 He has published more than thirty articles on Islam, nationalism, and modern Turkish politics, as well as four books: Toward an Islamic Enlightenment: The Gülen Movement (Oxford University Press, 2013); Islamic Political Identity in Turkey (Oxford University Press, 2003); Muslim Democracy and Secularism in Turkey (Cambridge University Press, 2009); ed. The Emergence of a New Turkey (University of Utah Press, 2007).